Enjoy outdoor living space without sun burn from now on! This replacement top cover for your gazebo could bring you a new life for relaxation and refreshment! This wonderful gazebo cover features PVC coating for protection against searing sun, pouring rain and other bad weather conditions. The PVC coating ensures that our cover is 100 % waterproof. Each cover has 8 grommet rings which work as overflows in case of heavy rains. Since they are on the side of the cover, it will not affect the rain protection when you are sitting underneath. 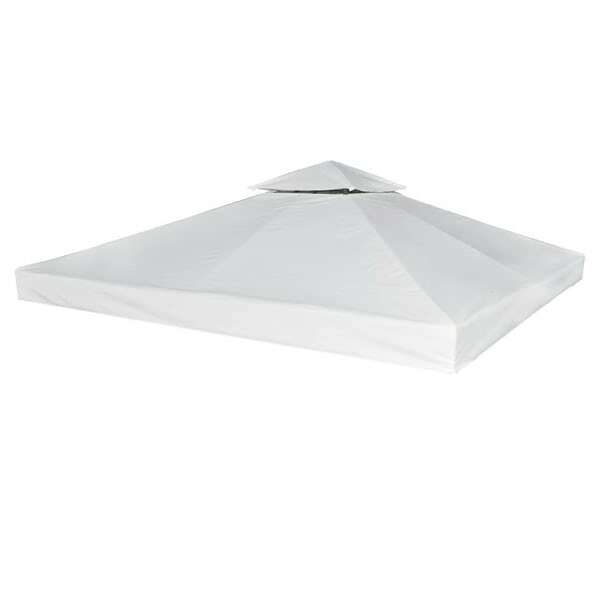 The fabric weights 9.14 oz/yd², and with reinforced corners for increased durability, this perfect shelter will stand a severe test for year round to provide you a pleasing and breezy get-together with your family or your friends. Please note this is the top cover only. Delivery does not include the gazebo frame. This is a high-quality replacement top cover for people that already have a frame. We also offer 16 pieces of hook and loop fasteners for easy installation and attachment to your gazebo frame. Top tier size: 2' 8" x 2' 8"